Lebuhraya Lembah Klang Selatan or S.K.V.E. Directions: From Kajang, head towards Putrajaya / Serdang/ UPM via SILK. The SKVE expressway begins where SILK ends near the UNITEN campus. Info / Insights: When fully completed, the new SKVE (South Klang Valley Expressway) will eventually link Kajang/ Bangi to Pulau Indah (Westport) and Pulau Carey. In between, it also connects users to Putrajaya / Cyberjaya and Sepang Airport via the Central Link. See updated map, video and info at the New MyCen SKVE Page. The expressway currently ends at Puchong, when traveling from Kajang. For westbound vehicles, enter at the Ayer Hitam Toll Plaza just after MAEPS and Uniten. On the other end, exit at the Saujana Putra Toll Plaza. The approximately 12 km stretch should take about 10 minutes. The highway also serves as an alternative route to the congested LDP (Lebuhraya Damansara-Puchong). 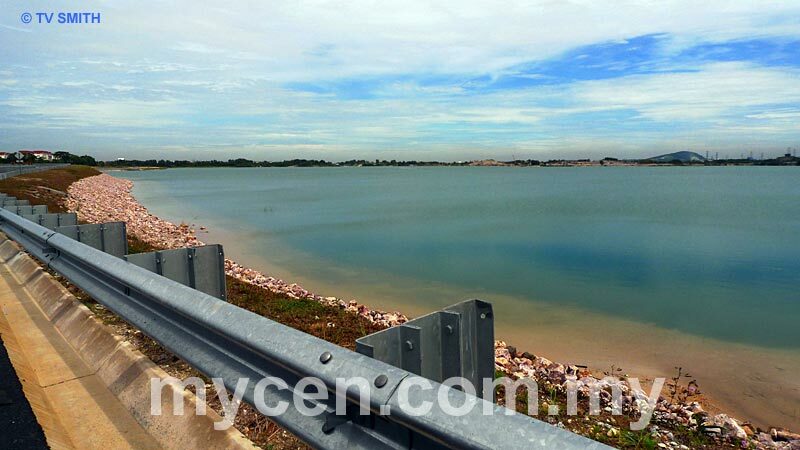 For many travelers it may be their first opportunity to marvel at the many gigantic 'lakes' dotting the Puchong landscape. At one part, it feels as though one is driving along a coastal road. The so-called lakes are actually former (excavated) tin mines from an industry that once propelled the Malaysian economy. Today, their epitaphial scars -- in the form of watery graves -- stand eerily in many parts of Klang (and Kinta) Valley. Addendum: You might be astonished to see another toll gate (of the same name), a few meters after exiting SKVE at Saujana Putra. The plaza is for entering/exiting the North-South Expressway Central Link NSECL (Lebuhraya Utara-Selatan Hubungan Tengah) or ELITE Highway (E6) to KLIA/Nilai or NKVE. There is an alternative access to the left of the roundabout.